00:00:09.21	I'm a professor at UC Berkeley and department co-chair. 00:00:13.02	And today I'd like to tell you about actin endocytosis and the early days of yeast cell biology. 00:00:19.17	This is a ribbon diagram of an actin monomer. 00:00:23.18	The functional form of actin is a polymer of actin monomers. 00:00:28.11	Shown here, this is an actin filament. 00:00:32.13	And it's made of these monomers which have assembled into this sort of helical, flexible filament. 00:00:40.03	One of the most important features of actin filaments is their polarity. 00:00:44.21	And what that means is that each of the monomers in the filament is assembled in the same orientation. 00:00:51.03	So in other words, in this diagram, the nucleotide binding cleft is pointed down in every monomer. 00:01:03.02	this end, which is the barbed end of the actin filament. 00:01:07.13	That polarity has important functional consequences for the filament. 00:01:11.09	First of all, one end of the actin filament grows much better than the other end. 00:01:16.10	That is the so-called plus end of the filament, or barbed end. 00:01:27.20	on the actin filament. 00:01:28.20	And so, typically, they will move towards the plus end of the actin filament. 00:01:46.23	actin structures, and each of these actin structures performs different functions. 00:01:51.18	The actin structures over here are making microvilli in the top of this epithelial cell. 00:01:58.17	The actin structures here are giving the cell cortex its rigidity. 00:02:09.09	within tissue layers of cells. 00:02:11.07	The bottom set of cells are all fibroblasts. 00:02:13.24	And so you can see that the same fibroblast cell can have many different networks of actin. 00:02:20.01	There's the cortex, the lamellipodial actin, the filopodial actin, and stress fibers. 00:02:25.13	And each of these has a distinct composition and a distinct function in the cell. 00:02:34.25	and a cytokinetic ring assembles. 00:02:42.13	that were there in the interphase cell reassemble. 00:02:50.12	their different functions in cells. 00:03:06.09	and the properties that are added to the cytoskeleton by various actin binding proteins. 00:03:20.19	myosin heav... the myosin head group. 00:03:24.00	And it decorated a segment of the myosin... of the actin filament. 00:03:29.11	And then, actin monomers, additional monomers, were added. 00:03:38.20	revealing that polarity that I was talking about a second ago. 00:03:54.06	I'm sorry, the ATP-and the ADP-actin monomers as they assemble on actin filaments. 00:04:07.25	of the actin filament, we learned some important things. 00:04:11.07	We learned that actin preferentially assembles on the plus end. 00:04:22.05	drive the rearrangements of actin that occur in cells, based just on disassembly of pure actin. 00:04:28.00	There must be other factors in the cell that mediate the disassembly of actin filaments. 00:04:46.15	of ATP to ADP. 00:04:52.25	inorganic phosphate, and one then has ADP-actin. 00:05:05.20	and the oldest part of the actin is ADP-actin. 00:05:09.00	And that has very important consequences for the regulation of the turnover of the actin filament. 00:05:23.09	On the top, we see, again, the structure of the actin monomer, with its nucleotide binding cleft. 00:05:30.08	We see the assembly reactions for the assembly of actin. 00:05:35.01	The rate-limiting step is to make a nucleus, or trimer of actin, which is very slow. 00:05:46.14	There are proteins that bind to monomers. 00:05:48.25	There are nucleating proteins called formins and the Arp2/3 complex. 00:05:59.10	the filament or to sever the filament or to cap growing filaments. 00:06:03.20	And finally, there are myosins that create forces on the filaments. 00:06:12.03	and their mechanisms were worked out biochemically. 00:06:15.15	And so biochemistry can tell you how things might work in the cell. 00:06:19.20	But it can't tell you how things do work in the cell. 00:06:22.11	For that, you need to do studies in cells. 00:06:24.23	And for those sorts of studies, model organisms have played a very important role. 00:06:28.26	One of the key model organisms was the Listeria monocytogenes, a pathogen. 00:06:34.22	And then others are the model organisms, like yeast, worms, flies, and so on and so forth. 00:06:46.05	what are actin's key biological functions? 00:06:49.25	How are actin functions affected by actin's intrinsic properties? 00:06:54.01	By actin binding proteins? 00:06:56.06	Which proteins, and how do they work? 00:07:04.17	And finally, how do actin assembly and myosin motors together create forces inside cells? 00:07:16.23	in this experiment, there is a fluorescence assay that can be used. 00:07:20.25	And if you look at pure actin alone, when it assembles it assembles very slowly, okay? 00:07:26.11	And there's a bit of a lag phase. 00:07:40.24	And that was done in this second curve, where a nucleator was added. 00:07:45.05	And you can see the actin assembled explosively, without any delay, okay? 00:07:49.23	So, how do we know, then, in the cell, how actin is being regulated? 00:08:17.02	when much of the mechanistic understanding of how actin is regulated in cells was worked out. 00:08:21.24	And a lot of those studies used this Listeria system. 00:08:26.13	Listeria, this pathogen, interacts with a host cell and it gets taken up by phagocytosis. 00:08:33.10	And then it... it does some remarkable things. 00:08:35.08	It breaks out of the phagosome. 00:08:37.07	And then the most remarkable thing is it starts to assemble actin around the pathogen. 00:08:43.12	And the actin then makes a tail. 00:08:45.11	And that tail causes the Listeria to be propelled through the cytoplasm. 00:08:55.02	by phagocytosis into the neighboring cell through this actin mediated process. 00:08:59.09	And that... by that process, it avoids detection by the immune system. 00:09:04.17	So, what were some of the key discoveries that were made with Listeria? 00:09:15.21	to be the key protein for nucleating actin assembly. 00:09:21.03	It was the key bacterial protein. 00:09:23.00	And it interacted with a host protein complex in order to do that. 00:09:27.25	And so that was found by... the ActA was found by Pascale Cossart. 00:09:39.01	was then worked out using the Listeria system by Theriot, Mitchison, Tilney, and Portnoy. 00:09:49.22	thanks to the work of Welch and colleagues in the Mitchison lab. 00:09:56.17	So, the Arp2/3 complex, then. 00:09:58.06	So, the Arp2/3 complex was purified in Tom Pollard's lab by Laura Machesky. 00:10:04.24	And it was a fascinating complex of seven proteins, two of which are related to actin. 00:10:09.17	At the time it was discovered, the function of the complex was not known. 00:10:19.02	that allowed Listeria to propel itself through the cytoplasm. 00:10:22.26	And he identified the Arp2/3 complex as the key mediator of actin assembly. 00:10:35.21	are called the formins. 00:10:41.06	and Zigmond's and Bi's labs all collaborating with each other. 00:10:44.14	And this was a really fascinating protein that nucleates actin. 00:10:47.19	And it stays associated, really interestingly, with the fast-growing end of the actin filament. 00:11:05.20	to nucleate actin assembly. 00:11:07.28	So, that... this led to the search for the host activator of the Arp2/3 complex. 00:11:22.05	this Arp2/3 complex, which was another important advance. 00:11:34.00	and it activates N-WASP to turn on actin assembly. 00:11:38.26	So... but how does Listeria motility work? 00:11:42.26	One can imagine two general scenarios. 00:11:52.04	that tail to propel the Listeria through the cytoplasm. 00:12:03.21	And if that happens, how does it happen? 00:12:05.16	And so this was a really important paper, then, by Theriot et al. 00:12:10.00	And what they did is a very clever experiment. 00:12:13.28	They watched Listeria moving through the cytoplasm in phase. 00:12:18.01	It's very hard to see in these micrographs, but it's this dark thing, here. 00:12:22.26	And then, in these cells, they introduced a photoactivatable actin. 00:12:32.24	a bar in the actin tail, okay? 00:12:36.28	And then they watched what happens over time. 00:12:44.24	that photoactivated actin bar should have moved along with the Listeria through the cytoplasm. 00:12:49.25	But that's not what happened. 00:12:56.03	stayed in the same place as the Listeria moved away. 00:13:05.06	and propelling it through the cytoplasm. 00:13:14.17	driving force for bacterial propulsion. 00:13:31.19	to imagine that this is the same mechanism that drives a cell as it migrates across a surface. 00:13:44.05	of motility in the lab of Pantaloni and Carlier. 00:13:48.08	And so they reconstituted, in vitro, the motility of Listeria and Shigella. 00:14:02.25	and sufficient for motility of the Listeria. 00:14:05.13	And those are shown over here. 00:14:13.07	and actin depolymerizing factor, otherwise known as cofilin. 00:14:18.10	Those factors were necessary and sufficient for motility. 00:14:21.28	Other factors, shown here, were able to enhance the motility, but they weren't essential for motility. 00:14:35.21	provided by the host were, in addition to actin, the Arp2/3 complex, cofilin, and capping protein. 00:14:42.01	And then other proteins, like profilin, enhanced the motility. 00:14:46.09	So, does this mechanism operate in mammalian cells? 00:14:51.26	For when cells migrate, say, across a surface? 00:14:54.02	So, this is a really nice movie made in the lab of Michael Sixt. 00:15:12.10	of the migrating cell. 00:15:14.01	Is actin assembling at the leading edge of a migrating cell? 00:15:17.03	This has now been demonstrated in a number of labs. 00:15:23.13	they've expressed mCherry-actin in this... in a cell, to label all the actin structures. 00:15:30.23	And the cell also expresses a photoactivatable GFP. 00:15:43.07	and then watch what happens. 00:15:48.26	actin moves away from the leading edge towards the interior. 00:15:56.10	fluxing towards the interior of the cell as the cell migrates forward. 00:16:07.02	Here, photobleaching is used in a... to bleach the actin at the leading edge of a migrating cell. 00:16:14.06	And the bleach spot, there, migrates inward. 00:16:27.24	actin is continuously assembling at the leading edge. 00:16:36.03	is what's also important for driving motility of mammalian cells. 00:16:43.06	So, how does that form of motility work? 00:17:03.13	the end of that filament. 00:17:04.25	But how can they do that if the filament is pushing against the membrane? 00:17:08.17	And so this is a really nice animation made by... made by Scot Kuo at Johns Hopkins. 00:17:13.17	And the idea is that there's a Brownian ratchet at work. 00:17:17.08	And this was an idea put forth by Mogilner and Oster. 00:17:31.23	new subunits can add. 00:17:34.00	There have been revisions to this. 00:17:48.21	and when they bend back towards the membrane a pressure builds. 00:17:58.13	So, we have this complex system with many different proteins. 00:18:20.15	fully understand how the cytoskeleton is regulated? 00:18:24.02	And so, one promising approach might be the use of genetics. 00:18:28.23	Genetics revealed the pathways for assembly of these complex phage structures. 00:18:33.18	If genetics could do that, could genetics also help to unravel cytoskeletal functions? 00:18:39.02	Genetics also revealed cell cycle control pathways in yeast. 00:18:42.18	Could genetics, then, unravel cytoskeletal functions? 00:19:06.27	in yeast cells was the ability to actually see cytoskeletal structures. 00:19:15.07	because where they form and how they're organized tells us a lot about they how they function. 00:19:35.09	worked out fluorescence microscopy for yeast cells. 00:19:48.00	work out how these cytoskeletal structures reorganize themselves through the cell cycle. 00:20:07.24	the dynamics and function of these key cytoskeletal elements. 00:20:17.00	if it was possible to do biochemistry. 00:20:28.21	I mean, of actin filaments, and purified Drosophila proteins. 00:20:32.05	And it turned out the same trick works in yeast. 00:20:34.14	Here, the protein fimbrin, an actin bundling protein, was identified. 00:20:39.14	Genetics could also be used to identify actin binding proteins and to reveal their functions. 00:20:57.04	needed for its function. 00:21:03.28	would not be able to interact normally with some of its binding partners. 00:21:15.18	getting an extragenic suppressor in another gene. 00:21:19.04	And in fact, the first gene she found was a gene sac6, which encodes yeast fimbrin. 00:21:32.20	they made the system particularly powerful. 00:21:39.10	cell biology studies of actin. 00:21:40.25	Ken Wertman made a large library of site-directed mutants in actin. 00:21:57.00	with the actin monomer. 00:22:04.02	this collection of mutants. 00:22:12.14	wasn't available in yeast, and that is a small molecule inhibitor. 00:22:15.13	So, in many cells, cytochalasin D had been the popular inhibitor for inhibiting actin assembly. 00:22:23.01	But cytochalasin D didn't do anything to yeast cells. 00:22:34.04	at binding actin monomers and preventing their polymerization. 00:22:50.09	which pathways were actin-independent when a yeast cell begins to develop cell polarity. 00:23:03.28	And endocytosis had been well characterized morphogenetically. 00:23:25.15	had showed that clathrin often is interacting closely with actin filaments. 00:23:31.06	And so, now that... although the functions of these interactions hadn't been revealed. 00:23:44.00	and other cytoskeletal elements are functioning in yeast... in yeast cells. 00:23:53.21	cell biological problems in yeast cells. 00:24:16.01	and disassembly, or at least that have the capacity to do that in vitro. 00:24:21.09	But actin's functions in vivo had not been completely determined. 00:24:33.09	what the emergent properties of that complex system are, hadn't been worked out. 00:24:45.13	made yeast very attractive for studies of actin functions in vivo. 00:00:21.07	for endocytic trafficking in budding yeast. 00:00:24.02	So, this is a micrograph of the actin cytoskeleton of budding yeast. 00:00:30.26	Budding yeast have a mother cell and a daughter cell that grows upon the mother cell. 00:00:39.11	to reveal its actin structures. 00:00:52.25	other materials from the mother cell to the daughter cell. 00:00:57.03	And then there are these actin patches. 00:00:59.18	And we now know that these actin patches are sites of clathrin-mediated endocytosis. 00:01:16.27	governing the behavior and function of clathrin-mediated endocytosis. 00:01:31.08	Kilmartin, Adams, and Pringle first saw them by immunofluorescence. 00:01:35.05	And we decided to take the microscopy down to an ultra-structural level and do immuno-EM. 00:01:40.05	And this is an electron micrograph that Jon Mulholland made of one of these cortical patches. 00:01:46.27	And it's immuno-gold stained for actin. 00:01:55.19	in the plasma membrane that are coated with actin. 00:02:06.13	were endocytic sites or maybe exocytic sites. 00:02:09.25	You could have gotten a similar structure by either type of process. 00:02:13.05	Or maybe they were some kind of signaling or stress-sensing structure. 00:02:17.25	We didn't know the function. 00:02:20.06	But we and others were doing studies in yeast to begin to investigate the actin cytoskeleton. 00:02:30.22	patch proteins were being identified. 00:02:44.22	and as genetic interactions. 00:02:46.14	Well, still, we didn't know the functions. 00:02:48.15	Some of the proteins, though, that we found in this network had really intriguing activities. 00:03:01.18	that I talked about in the first video in this... in this series. 00:03:18.14	anything to do with each other. 00:03:26.18	try to work out the relationships between these proteins in this network. 00:03:36.09	with either green fluorescent protein or red fluorescent protein, and making movies. 00:03:57.01	They were forming and moving around and disappearing. 00:03:59.20	They had rather short... short lifetimes. 00:04:08.07	and gained a number of insights from his analysis. 00:04:11.16	And so, the first thing that was key was that he did two-color imaging. 00:04:28.00	some green patches, and a few yellow patches. 00:04:35.10	on the cortex of the yeast cell. 00:04:42.13	just actin, the red ones, and a few that are yellow, that have both proteins together. 00:04:59.10	is green and, invariably, that patch after a short time will turn yellow, okay? 00:05:04.09	And then at the end of its lifetime, it will turn red. 00:05:18.12	into the interior of the cell. 00:05:26.07	that he did was to use medial focal planes in his analysis. 00:05:37.15	looking from the side. 00:05:44.14	moving off the surface of the cell into the cell. 00:05:47.10	And one of the key analytical tools that he used was to make kymographs, okay? 00:06:10.26	that it forms on the surface of the cell, and then it starts to move off the surface. 00:06:16.22	Going down means moving into the interior the cell; that's why you get this hook shape. 00:06:26.24	which we now know is an endocytic site. 00:06:28.15	When actin assembles, this kymograph curves into the cell. 00:06:46.14	and enter into the cytoplasm when actin begins to assemble. 00:06:57.08	looking at the Sla1 endocytic adapter. 00:07:00.21	And he looked at a number of these events on the surface. 00:07:09.12	and a red dot every time the patch has disappeared. 00:07:17.11	into the interior of the cell. 00:07:18.27	That happens every single time. 00:07:36.11	that we'd seen at the plasma membrane. 00:07:38.28	This is an electron micrograph by Kent McDonald at Berkeley. 00:07:49.23	permutations of two-color imaging. 00:07:52.00	We were able to develop a model. 00:07:57.19	were individual endocytic events. 00:08:04.00	an endocytic site was beginning to assemble. 00:08:07.23	And it would continue to assemble over time. 00:08:09.27	And then there would be a burst of actin assembly. 00:08:12.19	That actin assembly would generate a force. 00:08:19.28	some of the endocytic proteins would disappear, and we'd see the vesicle enter into the cytoplasm. 00:08:25.16	Okay, so what happens to these vesicles once they pinch off from the membrane? 00:08:36.16	she could fluorescently label the pheromone alpha factor that's taken up by endocytosis. 00:08:41.24	And she could use that to label these early endosomes in red. 00:08:50.05	very efficiently being trafficked from the cell surface to the early endosome. 00:09:03.15	a vacuum cleaner vacuuming up the vesicles. 00:09:11.00	is occurring on actin cables in the cytoplasm. 00:09:15.22	So, what about actin? 00:09:22.16	but what is the function of actin? 00:09:42.23	site forms and then the coat moves off the surface into the interior of the cell. 00:09:53.16	endocytosis was completely blocked. 00:09:56.26	There was no internalization, and the patch never disassembled. 00:10:01.06	So, actin assembly was required for this internalization step of endocytosis. 00:10:06.27	And it was required for the disassembly of these actin endocytic patch structures. 00:10:19.13	is forming there are proteins that accumulate, that can nucleate the assembly of actin filaments. 00:10:26.28	And then some of the actin filaments attach themselves to the coat. 00:10:31.06	There are proteins in the coat that we know, like Sla2, that bind to actin filaments. 00:10:40.25	and then fluxing into the cell. 00:11:21.24	it appeared and disappeared on the surface of the cell, but never moved off the surface. 00:11:32.13	into the cell before it disassembled. 00:11:34.21	That's shown here in this trace. 00:11:42.23	and then it moves a great distance into the cytoplasm when it assembles. 00:11:56.06	a number of different classes of behaviors. 00:12:09.04	very rapidly into the cell and then disappeared; and others moved a long distance into the cell. 00:12:30.14	made up the coat of the endocytic vesicle. 00:12:37.10	that nucleated actin assembly and that generated forces on actin. 00:12:53.13	which I'll come back to, which bind to curved membranes. 00:12:56.10	We think they were attracted by the curvature of the membrane that formed as it invaginated. 00:13:00.13	And then finally, the actin proteins ride with the vesicle, deeply into the cytoplasm. 00:13:13.02	and defined the process. 00:13:57.03	they were almost superimposable. 00:14:08.11	they were almost superimposable. 00:14:09.11	So, the process was remarkable... remarkably reproducible and regular in the kinetics. 00:14:23.21	what could make this pathway so regular and why it wasn't more noisy than it is. 00:14:37.17	and make the whole process more regular than it... than it might otherwise be. 00:14:52.28	with a distinct kinetics. 00:14:59.09	many of which are activators of the Arp2/3 complex, or here's a myosin. 00:15:13.04	and regulating the functions of the endocytic machinery. 00:15:24.19	an important question that was still unanswered was, what sort of endocytic pathway is this. 00:15:29.02	There's more than a half-dozen types of endocytic pathways known in mammalian cells. 00:15:34.11	Was this one of those pathways? 00:15:36.27	And the most obvious question to ask, is this a pathway for clathrin-mediated endocytosis? 00:15:47.15	confusing to look at by GFP tagging, for example. 00:16:02.10	at the surface of the cell. 00:16:03.18	We didn't know if that would work in yeast cells, but it actually worked really well. 00:16:06.08	So, the cell wall didn't get in the way. 00:16:08.23	And this is a kymograph looking at a number of different endocytic events. 00:16:17.26	clathrin came to the surface, and then different events where there was a burst of actin assembly. 00:16:27.26	by a burst of actin assembly, and then the two proteins disappear together. 00:16:31.23	So clearly, this was a pathway for clathrin-mediated endocytosis. 00:16:35.10	And so, this was shown both in my lab and in the lab of Sandy Lemmon at around the same time. 00:16:58.05	on the surface of the cell. 00:16:59.14	So, it's a pathway for clathrin-mediated endocytosis and it's dependent on actin assembly. 00:17:13.24	different proteins that are recruited in the pathway. 00:17:16.19	But what about their functions? 00:17:21.19	genetics and we can make mutations in everything. 00:17:39.26	and looked at them. 00:17:40.26	And here's a sample of some of the... some of their data. 00:17:44.06	And they saw lots of different phenotypes. 00:17:51.00	some formed huge endocytic patches, and so on and so forth. 00:18:04.20	make kymographs, again, okay? 00:18:19.08	they move off the surface into the cell. 00:18:27.25	the proteins that you've mutated are doing. 00:18:36.24	the internalization of the coat complex. 00:18:43.26	very slowly into the cell. 00:18:44.26	If we mutated the fimbrin gene, sac6, it was really interesting. 00:19:00.23	without that cross linking, there's no endocytic internalization. 00:19:05.22	A really interesting phenotype was this BAR protein, Rvs167. 00:19:17.08	but then something goes wrong. 00:19:19.13	And instead of internalizing, it snaps back to the plasma membrane. 00:19:28.28	There were proteins that were... played a role in the disassembly of the actin network. 00:19:34.19	And then there were proteins that were important for the initiation of actin assembly. 00:19:51.19	and I'll get back to that in the fourth segment in this series. 00:20:20.08	and then, finally, all the actin machinery that arrived very late in the process. 00:20:41.13	is generate... is generated, and then how is it stabilized? 00:20:50.20	Christopher Buser came and started doing high-pressure freezing and free substitution in the lab. 00:20:56.28	And he saw these beautiful flask-shaped endocytic structures in the cell. 00:21:12.15	where the actin is displacing ribosomes from the area around the endocytic invagination. 00:21:17.20	Now, each of these sites had a very clear sort of flask shape. 00:21:25.16	and then wide at the... at the vesicle region, again, in how that shape was generated. 00:21:35.18	this shape, and these are the so-called BAR proteins. 00:21:45.18	in that they bind specifically to curved membranes. 00:21:49.21	And they had been implicated in sculpting membranes. 00:21:52.00	And so we wanted to see if we could use this system to test for the functions of BAR proteins. 00:22:18.06	called Rvs167, together with RFP and GFP in the same cell. 00:22:25.21	And what he found was really interesting. 00:22:27.21	The F-BAR protein arrived first in this kymograph, and it never moved off the surface into the cell. 00:22:35.06	The... this is a protein that binds to wide... to membranes of low curvature. 00:22:50.02	and goes into the cell. 00:23:05.01	for the assembly of an endocytic site. 00:23:18.06	come and squeeze down the membrane. 00:23:21.12	And so, we could test these ideas by making mutants. 00:23:38.14	cells that were mutant in the BAR protein... interestingly, those [cells] had really wide invaginations. 00:23:52.02	of the endocytic invagination was wider. 00:23:59.07	had wide bases and wide tubules. 00:24:18.07	this curvature creates binding sites for the BAR proteins. 00:24:32.06	and the site snapped back to the membrane surface. 00:24:34.28	And this model is consistent with the phenotypes we saw in these different mutants. 00:24:53.20	to what happens in mammalian cells. 00:25:04.28	whereas in mammalian cells invaginations, the endocytic sites generally were spherical, okay? 00:25:18.01	be dissimilar, because most of the proteins are conserved from yeast to humans. 00:25:41.10	that look very much like the structures that we see in yeast. 00:25:55.06	the same sort of principles. 00:26:05.20	what happened when that F-BAR protein was removed. 00:26:08.15	Remember the F-BAR protein, the Bzz1, assembles at the base of the endocytic site. 00:26:27.01	at the base of the invagination started to move when actin assembled. 00:26:36.20	sites started to skid along. 00:26:42.28	here, as it internalizes the base of the invagination starts to slide along the membrane. 00:26:48.14	And you can see that in traces, here. 00:26:54.04	it doesn't move very much during its lifetime. 00:27:06.22	it starts to slide along the surface of the membrane. 00:27:20.11	it can push against that base and make a stable site. 00:27:38.22	of the endocytic... of the plasma membrane. 00:27:42.17	So, just to sort of summarize what we've learned about the yeast endocytic pathway. 00:27:48.15	We... along the top of this diagram are the events that we think are occurring in the pathway. 00:28:07.11	series of events that occur with predictable timing and predictable order. 00:28:24.22	as well as when they arrive in this process. 00:28:34.11	into what individual... many individual proteins are doing this... in this process. 00:28:38.20	We know that actin is important for internalizing the membrane. 00:28:49.22	and come very late. 00:29:03.14	to work out such a rich and detailed pathway for endocytosis. 00:29:21.25	without changing the expression level of proteins, so we haven't perturbed the pathway. 00:29:50.17	a very powerful system for these studies. 00:30:00.24	on endocytosis in yeast. 00:30:02.27	And next I'll talk about our studies on endocytosis in mammalian cells. 00:00:08.21	I'm David Drubin, a professor and co-chair at the University of California, Berkeley. 00:00:25.07	to mammalian cells to study how actin dynamics are harnessed for endocytic trafficking. 00:00:40.06	has been very well worked out. 00:00:55.14	is taken up by clathrin-mediated endocytosis, as well as viruses. 00:01:12.14	often seemed to be connected to the actin cytoskeleton. 00:01:15.26	For a long time, whether the actin cytoskeleton was participating in endocytosis was not clear. 00:01:24.02	In yeast, it's very clear that actin is essential for clathrin-mediated endocytosis. 00:01:54.23	and the endocytic pathway. 00:02:01.04	when we started working on mammalian cells, we decided to focus on this protein Hip1R. 00:02:04.23	It stands for Huntingtin interacting protein. 00:02:18.28	actin cytoskeleton and the endocytic pathway. 00:02:26.24	in mammalian cells -- and see if the protein was doing something similar. 00:02:45.20	in green, and clathrin, in red. 00:02:49.12	So, it seemed that this protein, at least, had a conserved set of interactions. 00:02:56.25	In yeast, it was known to bind to actin, to bind to clathrin, to bind to PIP2. 00:03:19.22	white dots -- that Hip1R is located in association with these clathrin coats. 00:03:33.13	it's perhaps mediating interactions of the actin cytoskeleton with the clathrin coat. 00:03:47.12	the expression of Hip1R using siRNA and saw a really interesting phenotype. 00:03:59.09	with actin tails, marked by an RFP-labeled Arp2/3 complex subunit. 00:04:06.22	So, knocking down Hip1R caused the actin cytoskeleton to become stably associated with endocytic sites. 00:04:20.22	the same phenotype occurs when you knock down Sla2 in budding yeast. 00:04:31.11	fundamental way, conserved from yeast to humans. 00:04:45.25	and what we've learned in yeast would apply to mammals. 00:04:49.26	So, what are the questions we hoped to ask in mammalian cells? 00:04:54.14	We wanted to know, what are the roles for actin during clathrin-mediated endocytosis? 00:04:59.23	We wanted to know how the dynamics and morphology of endocytic sites are regulated. 00:05:05.11	We wanted to know how regular endocytic events are in mammalian cells. 00:05:18.16	to be somewhat irregular. 00:05:20.12	And a lot of events, it was reported, were actually abortive. 00:05:24.26	They started to form an endocytic site that then never went on to form a vesicle. 00:05:30.19	So, we wanted to see if, you know, how similar these processes were. 00:05:45.24	because that will be critical to understanding the functions that they're performing. 00:06:09.26	with red fluorescent protein. 00:06:19.05	and looked at their recruitment to endocytic sites. 00:06:28.24	whether actin was functioning in the endocytic pathway. 00:06:38.01	actin had never been seen in light microscopy studies to be associating with endocytic sites. 00:06:43.27	And that was because for most of the lifetime of the endocytic site there was no actin. 00:06:54.13	when the vesicle formed, okay? 00:07:01.14	was recruited to the... to the endocytic site. 00:07:05.00	So, that was an important insight. 00:07:07.03	And now, even more so, the yeast and mammalian pathways are looking very similar. 00:07:14.12	So, yeast and mammalian endocytosis -- how similar are they? 00:07:19.16	There's extensive protein and ultrastructural conservation in the... in the process. 00:07:31.09	and appeared to be very efficient. 00:07:36.19	from what had been reported in mammalian cells. 00:07:42.23	but not the mammalian pathway. 00:07:53.08	Or could some of the variability be due to how the processes were studied. 00:08:14.04	ectopically overexpress proteins tagged with GFP or RFP. 00:08:23.03	the genes that were already in the genome. 00:08:39.22	especially when we looked at clathrin, what the source of the clathrin was. 00:08:47.01	and moving into the cell. 00:08:59.28	other intracellular trafficking events. 00:09:10.24	this pathway also happen with a distinct order. 00:09:24.08	do the same thing. 00:09:25.08	We tagged clathrin with red fluorescent protein and dynamin with green fluorescent protein. 00:09:31.04	But we did it in a different way from how other people had done it before us. 00:09:35.22	We did it by endogenous tagging. 00:09:49.13	and using zinc finger nucleases. 00:10:06.03	and dynamin, as well as other proteins such as AP2, which is an endocytic adapter protein. 00:10:13.00	And then, you know, we started to look at endocytosis in mammalian cells. 00:10:24.21	that has been endogenously tagged for clathrin, in red, and dynamin, in green. 00:10:30.15	And when we watch this in real time, what we see are lots of red and green spots. 00:10:41.11	yellow and then green. 00:10:48.27	dynamin, in green, is coming along and pinching off the vesicle. 00:10:52.22	And so this was very nice. 00:11:00.20	proteins at endogenous levels. 00:11:06.10	was it really worth the effort? 00:11:15.22	was that a valid assumption? 00:11:24.12	to endogenously tagged clathrin and dynamin. 00:11:33.11	an entire movie like this, a 4-minute movie, into one figure, a three-dimensional kymograph. 00:11:40.22	And so that's shown here. 00:11:47.15	tagged with RFP for clathrin and GFP for dynamin. 00:11:51.22	And time is in the z dimension. 00:11:54.06	And so each of these pillars is an endocytic site. 00:11:56.25	And what you can see is that there's no real distinct phase when there's clathrin without dynamin. 00:12:05.24	The two sort of blur together. 00:12:06.24	You can't really distinguish the kinetics of one from the other very well. 00:12:11.05	Now, what would this look like if we endogenously tagged these two proteins? 00:12:15.20	Well, that's shown here. 00:12:24.15	for most of the lifetime of that endocytic sties, we only have clathrin. 00:12:34.25	results in the pinching off of an endocytic vesicle. 00:12:39.28	So, this is actually much more regular than had been reported by others in the field. 00:12:53.08	was worth... was worth the effort. 00:13:00.25	perturb functions and try to figure out what different proteins are doing in this process. 00:13:16.20	the right level of clathrin or dynamin. 00:13:24.05	and look at the lifetimes, for example, of clathrin. 00:13:33.00	that we can do this in an unbiased, systematic manner. 00:13:58.20	are irregular in their lifetimes. 00:14:09.20	and come up with a very nice kinetic profile of the formation of endocytic vesicles. 00:14:15.15	And so what we see in red is the appearance of clathrin. 00:14:19.04	It increases as the clathrin coat assembles. 00:14:21.17	It reaches a plateau. 00:14:23.10	And then, only after clathrin plateaus, there's a spike of dynamin assembly. 00:14:28.00	And then both proteins disappear together as in endocytic vesicle forms. 00:14:52.10	the number of molecules that appear at every event. 00:14:58.10	did that for dynamin. 00:15:05.08	pinch off an endocytic vesicle. 00:15:07.06	And so, these kind of studies, then, can provide lots of mechanistic insights into this process. 00:15:13.10	Now, let's get back to actin. 00:15:16.03	So, Merrifield found that he could see actin assembling at endocytic sites in his videos. 00:15:32.27	and you can see this branched actin network associated with this clathrin-coated vesicle that's forming. 00:15:41.21	So, clearly, actin and clathrin do associate in mammalian cells. 00:15:47.22	But one question is, how often do actin and clathrin associate? 00:15:52.22	Is actin an integral part of the clathrin-mediated endocytosis machinery? 00:15:56.21	Or is it just something that, say, gets recruited when membrane tension is high? 00:16:08.04	events, or at least around 90% of them, are terminated by a burst of actin assembly. 00:16:21.25	the appearance of dynamin, although sometimes it was after dynamin. 00:16:37.04	the endocytic process for clathrin-coated endocytosis. 00:16:51.01	which I showed before, that if we look in an untreated cell we see these curved hook structures. 00:17:02.28	as a vesicle forms. 00:17:04.11	But if we block actin assembly, we absolutely block endocytosis. 00:17:08.09	Now, what about the function of actin in endocytosis in mammalian cells? 00:17:14.10	It was... looking in different cell types, there were different reports. 00:17:18.15	Sometimes, actin assembly seemed to be important or helpful, and sometimes it didn't. 00:17:28.00	created a dependency on actin assembly. 00:17:30.08	But how important was actin just for endocytic events under normal conditions? 00:17:47.02	an extent that hadn't been done in other... in previous studies. 00:18:04.05	from left to right in these diagrams. 00:18:26.08	lifetimes of the dynamin get progressively longer and longer. 00:18:34.13	functioning to make the process more efficient for... we think, for every endocytic event. 00:19:03.03	around half or less of the events resulted in endocytic vesicles forming. 00:19:25.20	clathrin events into those that were under 20 seconds and those that were greater than 20 seconds. 00:19:31.02	And then she colocalized those events with dynamin. 00:19:40.27	and the clathrin is in red and the dynamin is in green. 00:19:47.28	the clathrin almost never colocalized with dynamin. 00:19:54.22	it almost always co-localized with dynamin. 00:20:23.17	in the TIRF field. 00:20:38.18	sources in the cell. 00:20:51.15	that's specific for sites of clathrin-mediated endocytosis. 00:21:09.12	plane of the plasma membrane. 00:21:10.14	And the same for AP2 that didn't have clathrin. 00:21:20.15	in the plasma membrane. 00:21:29.11	and dynamin, for example, she was able to come to the following conclusion. 00:21:44.12	and AP2, and its adapter, go on to form an endocytic vesicle. 00:21:49.06	They recruit... they recruit dynamin and they form a vesicle. 00:21:53.07	Some of those events may be aborted, a very low percent. 00:22:09.13	and the clathrin did not co-localize with AP2. 00:22:13.07	And they have lifetimes, generally, of less than 20 seconds. 00:22:35.11	that you have to filter out these events that are not authentic endocytic events. 00:22:45.05	see that the process is very efficient and very regular. 00:22:54.20	what kind of effects do you see when you... when you knock down specific proteins in this process? 00:23:15.20	of clathrin-mediated endocytosis and the morphology of these sites varied quite a bit. 00:23:21.25	And so we wondered, what could be the source of this variation? 00:23:25.11	Could it be studies in different species, say, rat versus human? 00:23:29.14	Could it be the cell type, say, a liver cell versus a fibroblast? 00:23:38.13	which are known to have all sorts of chromosome imbalances. 00:23:42.24	And so maybe it was a non-physiological state. 00:23:50.11	had been done in cancer-derived tissue culture cells? 00:24:04.00	So, on the right we see a karyotype for a HeLa cell. 00:24:08.15	And you can see that it's really very abnormal, okay? 00:24:11.21	The chromosomes, there... you don't see pairs of chromosomes. 00:24:14.06	You see, sometimes, four or five copies of a chromosome, there all sorts of massive translocations. 00:24:19.10	And this is only a snapshot of a HeLa cell. 00:24:22.13	This is constantly evolving. 00:24:29.00	because one of the hallmarks of cancer cells is chromosome instability. 00:24:40.21	that we obtained from Bruce Conklin's lab at UCSF. 00:24:45.24	And you can see that it has a normal karyotype, okay? 00:24:49.13	So, we decided we wanted to start doing our studies in human stem cells. 00:25:05.04	and then we could differentiate those cells to different states. 00:25:08.23	So, for example, we like to make neural progenitor cells and fibroblast cells. 00:25:32.25	changes in the process or... are there other sources? 00:25:38.07	And so what we found was very gratifying. 00:25:44.18	endocytic structures that are seen. 00:25:53.02	appear to be coming out from the sides of them. 00:25:56.04	And you could see similar things in other studies. 00:25:59.06	And so, are these... are these normal physiological states? 00:26:04.05	Why do you see them in some studies and not in others? 00:26:22.21	were somewhat large, but they were red and then they turned green. 00:26:33.06	And what we often see is that one of these structures flashes with green many times. 00:26:42.06	perhaps, plaques of clathrin that are making many endocytic vesicles. 00:26:46.06	The neural progenitor cells were really interesting, because they had a completely distinct phenotype. 00:26:55.19	just making clathrin and then dynamin, clathrin and dynamin very quickly. 00:27:06.08	the electron microscopy mapped very well onto what we saw in the light microscope. 00:27:11.11	The stem cells had sort of larger endocytic vesicles that they were forming. 00:27:17.25	The neural progenitors were making, uniformly, very small clathrin-coated vesicles. 00:27:43.07	and structure should be different. 00:27:49.24	as well as understand how. 00:27:52.00	And the how question, we've actually already made progress on. 00:27:59.28	at different levels in these cell types. 00:28:14.02	with a GFP-tagged AP2. 00:28:21.05	to these other cell types. 00:28:22.24	However, the AP2 is there. 00:28:30.26	So, this gave us a hypothesis. 00:28:39.03	and dynamics of the site, of these endocytic sites. 00:28:49.28	And so, we could ask whether that's true by knocking down AP2. 00:28:54.17	And now clathrin is in magenta and dynamin is in green. 00:29:03.24	that often flash green with dynamin. 00:29:12.15	in neural progenitor cells? 00:29:14.20	And that's shown here. 00:29:16.01	And now the fibroblasts are making lots of very small endocytic structures, very rapidly. 00:29:31.06	a key molecule in the control of the dynamics of these events. 00:29:49.11	which is a very non-physiological situation. 00:29:57.16	And so we've started to make organoids with the help from the Hockemeyer lab at UC Berkeley. 00:30:18.18	And we can get beautiful three-dimensional images. 00:30:28.00	looks much more like a tissue. 00:30:29.04	And so this particular tissue happens to be an intestinal epithelium. 00:30:35.02	And we can look at the differences in the apical and basolateral surfaces, for example. 00:30:46.22	of gene fusions to preserve cellular function. 00:30:57.28	and given us key mechanistic insights. 00:31:00.09	And then the regularity has facilitated genetic and chemical dissection of the process. 00:31:05.17	So, we believe we're getting more information with greater sensitivity. 00:31:21.04	from parent stem cells. 00:31:33.01	assays to... to explore functionality in this... in this process. 00:31:44.15	came from our theoretical collaboration with George Oster. 00:31:47.01	And this is a profile of an endocytic invagination. 00:32:15.07	But how do you test an idea like that? 00:32:34.04	the curvature of those pillars. 00:32:42.00	affect the endocytic process. 00:32:50.03	a biologically relevant range of diameters. 00:32:53.13	When we put the cells on these pillars... this is in a thin-section electron micrograph. 00:33:01.03	We could see a pillar, here. 00:33:03.17	And then the mammalian cell is sitting on top of the pillar. 00:33:07.00	And the plasma membrane is clearly wrapping itself around the pillar. 00:33:12.04	And a clathrin-coated vesicle is coming off the pillar. 00:33:15.06	This is an electron micrograph that Wenting Zhao made and it's just remarkable. 00:33:19.13	So, is that really... are these becoming sites of clathrin-mediated endocytosis? 00:33:30.13	our genome-edited cells on these bars. 00:33:38.00	the ends the curvature is going to be very high. 00:33:40.23	And when we did that, here's brightfield of two bars. 00:33:44.26	We put our genome-engineered cells with red clathrin and green dynamin. 00:33:48.18	This is a kymograph with time going down. 00:34:01.22	punctuated by green dynamin. 00:34:14.11	is talking to clathrin-mediated endocytosis. 00:34:18.26	And so, these are the folks that did a lot of the work that I about. 00:34:23.09	Aaron Cheng and Daphne Dambournet were responsible for the stem cell work. 00:34:29.14	Sun Hae Hong did our machine learning. 00:34:41.18	And Jeff Doyon and other were very important for starting us in the genome engineering. 00:00:08.21	I'm David Drubin I'm a professor and co-chair at the University of California, Berkeley. 00:00:25.14	in these cortical actin patches, which are sites of clathrin-mediated endocytosis. 00:00:33.17	This, again, is a summary of this endocytic pathway in budding yeast. 00:00:45.06	are driven by the assembly of actin and... which is followed immediately by actin disassembly. 00:00:51.18	So, actin assembles at a very predictable time in this pathway, for about eight seconds. 00:00:56.20	And then it begins to disassemble for the next eight seconds. 00:01:13.10	and disassembly of actin filaments. 00:01:16.00	And this happens to be an Arp2/3-mediated actin assembly pathway. 00:01:27.17	actin assembly pathway, including the Pollard and Carlier labs, and others. 00:01:34.11	And this diagram was made by Dyche Mullins in the Pollard lab... when he was in the Pollard lab. 00:02:10.28	by the Arp2/3 complex. 00:02:22.06	in my first segment, showed that there were some essential key steps here. 00:02:34.09	or sometimes... which is sometimes called actin depolarizing factor, or ADF. 00:02:39.09	There's the capping of filaments. 00:02:47.01	And then of course there's the nucleation of this network by the Arp2/3 complex. 00:02:51.13	And these were all the steps that were identified as essential in the reconstitution of Listeria motility. 00:03:12.25	So, I'd like to start, first, talking about the disassembly process. 00:03:17.07	Remember, actin assembles as ATP-actin. 00:03:20.09	As the filaments age, they become, eventually, ADP-actin. 00:03:23.20	And then they become substrates for fragmenting or severing by the protein cofilin. 00:03:43.06	that affected the viscosity of actin solutions, and they purified yeast cofilin. 00:04:20.18	the function of cofilin in the context of this actin-mediated endocytic pathway in budding yeast. 00:04:31.27	because cofilin only a 14 kD protein. 00:04:35.18	But he found an internal loop where he could make a GFP integration, and made a functional cofilin. 00:04:43.12	And so he was able to look at cofilin dynamics in living yeast cells. 00:04:54.06	so they're expressing an actin marker in red and cofilin in green. 00:05:03.10	with a delay of about three and a half seconds, cofilin gets recruited to that site. 00:05:08.02	And that's consistent with cofilin binding to ADP-actin and not-ATP actin. 00:05:42.12	being attracted to ADP-actin and not ATP-actin. 00:05:55.15	in actin disassembly and assembly. 00:06:22.06	lined up on one surface. 00:06:41.21	interior of the cell, just as you would see in a mammalian cell at the lamellipodium. 00:06:48.03	And so he could measure the rate, and the flux was at about 45 nanometers per second. 00:06:53.06	So, Voytek wanted to use these networks as a system to study cofilin's function. 00:06:58.22	And so he put cofilin mutants in this background that makes these actin networks. 00:07:11.21	where is that cofilin in these networks? 00:07:14.15	And so, he could label the entire network with an actin binding protein, uniformly. 00:07:25.00	and was in the older part of the network. 00:07:33.06	that's oldest, away from the surface, where ADP-actin is enriched. 00:07:48.16	of the cell a short distance into the interior of the cell, here and here. 00:07:59.24	and they extended all the way across the surface to the other end of the cell. 00:08:08.15	from one side of the cell to the... to the next. 00:08:10.27	So, cofilin was important for turning over the actin networks. 00:08:20.13	relative to cells with wild type cofilin. 00:08:28.16	when mutants were made in cofilin. 00:08:29.17	So, cofilin was important for dynamic assembly and disassembly of actin networks in living cells. 00:08:37.06	So, how... what was cofilin's importance for this endocytic pathway? 00:08:47.10	fuse very rapidly with endosomes after they form, guided by actin filaments. 00:08:54.02	What Voytek found is that when cofilin is defective this step becomes... becomes impaired. 00:09:12.10	and then cofilin comes and takes apart the actin network. 00:09:16.17	And then the vesicle is left without actin and it can fuse with endosomes. 00:09:27.03	in the endocytic pathway are impaired. 00:09:34.08	who had made an interesting observation. 00:09:36.20	He found this protein that he called Aip1, for actin interacting protein. 00:09:42.00	He found it in a two-hybrid screen as a protein that binds to actin. 00:09:46.06	And he also found that it binds to cofilin. 00:09:57.06	be working together with cofilin. 00:10:00.01	And so, here's an assay that Avi did. 00:10:03.16	And in this assay, you can add cofilin to actin filaments. 00:10:21.08	oligomers that will pellet. 00:10:30.03	now the actin moved completely to the supernatant. 00:10:40.10	even an effect here evident at 1:50 levels. 00:10:53.26	actin monomers that could not be pelleted by ultracentrifugation. 00:11:11.05	when he was analyzing the phenotype of Aip1 cells. 00:11:20.05	assays, it's in vivo effect was much more subtle. 00:11:24.03	In order to see the effect, he had to treat the cells with latrunculin A, this monomer binding drug. 00:11:34.13	latrunculin A, they could still assemble actin, okay? 00:11:55.13	they were continuing to occur several minutes out. 00:11:58.22	We could still get a robust burst of actin assembly to drive endocytic internalization. 00:12:09.00	most of the structures in the cell and has soaked up the actin monomers? 00:12:13.06	And so we generated a hypothesis for this. 00:12:22.17	in the cell, and that these oligomers are resistant to the action of latrunculin A. 00:12:28.04	So, how could he show that? 00:12:35.18	looking at actin oligomers. 00:12:50.11	were preserved when you ran non-reducing gels. 00:12:54.05	And so, here, Voytek did a biochemical assay where he used this trick. 00:13:05.19	see many oligomers in in his reaction using this cross-linking agent. 00:13:12.02	So, cofilin was not sufficient to break down the oligomers into monomers. 00:13:24.02	the number of monomers. 00:13:30.20	they were able to produce actin monomers. 00:13:40.14	that the monomer pool was depleted and the oligomer pool was increased in Aip1-null mutants. 00:13:59.02	the actin oligomers can anneal in vitro. 00:14:12.28	assemble in a living cell. 00:14:22.01	by the Arp2/3 complex that controls their elongation. 00:14:26.17	And you'll recall that capping was important, essential, for the movement of Listeria. 00:14:43.11	and introducing those into a concentrated yeast extract. 00:14:46.18	These spheres would then assemble actin tails, which would propel them through the extract. 00:14:56.26	study mechanisms like filament capping. 00:15:15.17	Capping protein, cofilin, and Arp2/3 were the essential components. 00:15:32.04	there were often very subtle effects. 00:15:33.24	And this is true in yeast cells. 00:15:42.02	still occurs, this act... very much actin-dependent process. 00:15:46.18	So, what was going on? 00:15:53.18	was one of the essential proteins in their reconstituted system. 00:15:59.02	And so we came up with a hypothesis. 00:16:06.11	multiple functions that control the growth of actin filaments. 00:16:27.00	when you make the double mutants. 00:16:29.01	And so we got together with Constanzo and Boone in Toronto, and we started there. 00:16:34.22	The captain protein is a heterodimer made from Cap1 and Cap2. 00:16:45.03	along the middle, here, that all were... had synthetic phenotypes with mutants of capping protein. 00:16:50.19	And these were all, then, candidates for new factors that control filament elongation. 00:16:55.16	And here was our friend Aip1, as well as abp1, a gene that we'd found some years ago in the lab. 00:17:02.24	And it turns out Abp1 one makes a complex with Aim3, and Aip1 associates with cofilin. 00:17:22.09	would propel beads through the... through the yeast extract. 00:17:42.21	which was evidence for redundancy in these elongation regulation mechanisms. 00:18:14.14	capping protein was in the newer part of the network. 00:18:47.00	the growth of actin filaments. 00:18:48.09	There's capping protein, shown in yellow, here. 00:18:50.22	There's this Abp1 protein that works with Aim3, in purple. 00:18:55.22	And then there's Aip1, in green. 00:18:58.22	And that Aip1 and capping protein occupy different parts of the network. 00:19:08.04	enough capping activity to control the network. 00:19:22.02	of their actin network. 00:19:40.06	by the Arp2/3 complex. 00:19:54.27	different functions at different times and positions in these endocytic events. 00:20:05.10	called Las17, and it contains a type 1 myosin, plus some half-dozen additional proteins. 00:20:18.02	on those... on those actin filaments. 00:20:20.16	And so, we've been very interested in a couple of questions. 00:20:30.04	What activities are necessary? 00:20:31.24	And then, also, why is this whole pathway so complex? 00:20:34.27	Why do you need so many proteins to make a vesicle? 00:20:41.23	which has many proteins that were all... all had multiple domains. 00:21:08.08	proteins in this module as a complex. 00:21:23.00	find what are the essential activities for endocytosis. 00:21:31.16	they made an artificial fusion protein, which is shown here. 00:21:42.10	were a couple domains from a type 1 myosin, and a couple domains from the yeast WASP protein. 00:21:50.08	And that was sufficient. 00:21:57.00	the module and make productive endocytic vesicles. 00:22:00.11	So, what are the activities, then, that are contained in this module? 00:22:04.08	There are four activities and they're shown here. 00:22:15.08	That is absolutely essential to nucleate actin filaments for productive endocytic events. 00:22:20.11	The second is a myosin motor activity. 00:22:23.01	A myosin motor activity is essential for productive endocytic events. 00:22:27.05	You also need a so-called TH1 domain that binds to acidic phospholipids. 00:22:40.23	is required to recruit this molecule to the endocytic site. 00:23:12.06	liquid droplets in solution, okay?, in biochemical studies. 00:23:37.02	They have many of these -- multiple SH3 domains, multiple proline-rich domains. 00:23:54.19	bringing it to the endocytic site to nucleate this burst of actin assembly. 00:23:59.26	And so, some years ago, we found a master regulator of endocytosis in yeast. 00:24:05.22	There's a protein kinase called Prk1. 00:24:13.17	this kinase, and the kinase feeds back and turns off actin assembly. 00:24:26.14	Kevan Shokat at UCSF developed. 00:24:28.17	And so that gave us a chemical switch, where we could turn on and off the kinase. 00:24:32.02	And so, remember, this kinase causes the actin nucleation to stop. 00:24:43.06	that they can't be disassembled. 00:24:45.18	And so here we've done that, and we've added this inhibitor right now. 00:24:50.04	And now, what happens is new sites assemble but they can't disassemble. 00:24:59.00	behavior that looks very much like liquid droplets. 00:25:01.13	There was another big fusion event. 00:25:13.22	and now we wash out the inhibitor, what we find is that immediately this structure dissolves. 00:25:19.22	Again, behavior that looks like a liquid droplet. 00:25:49.02	network that would dissociate the endocytic machinery from the actin assembly machinery. 00:26:01.27	Interestingly, all of these proteins have homologues in mammalian cells. 00:26:11.18	to endocytic sites, in these cells, have a homologue called intersectin in mammalian cells. 00:26:21.21	So, what happens when you snip these two specific interactions? 00:26:26.24	What happens is really fascinating. 00:26:34.01	but the actin, now shown in red, is completely uncoupled from the endocytic sites. 00:26:42.24	look a lot like these Listeria that swim around inside the cell. 00:26:46.13	So, Lis... so, Yidi was able to uncouple actin assembly from the formation of the endocytic sites. 00:26:58.10	back to the endocytic site. 00:27:13.02	but while WASP is accumulating there's no actin assembly. 00:27:16.17	It's not until you get to a certain level, when suddenly there's a burst of actin assembly. 00:27:22.13	It seems to occur in sort of an all-or-nothing or switch-like manner. 00:27:40.20	before, again, there was this sudden burst of actin assembly. 00:28:11.06	current and former members of lab, and they are all listed here. 00:28:15.10	And that's the last of my four segments. Actin forms many cellular structures and regulates a variety of critical biological processes. 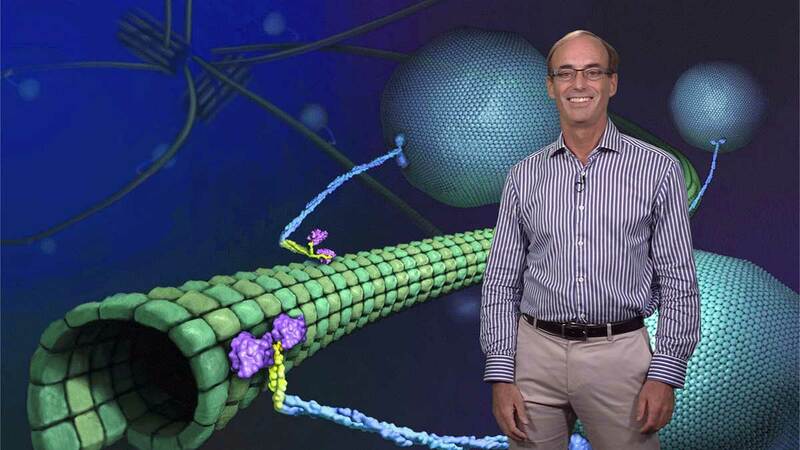 Dr. David Drubin’s lab focuses on studying actin in the context of membrane trafficking. In his first iBiology seminar, Drubin recounts seminal research done using the intracellular pathogen Listeria that uncovered how the bacteria harnesses phagocytosis and actin polymerization to facilitate motility. These initial studies led to the discovery of key regulators of actin filament formation including Arp2/3 and N-WASP. Advances in yeast genetics, biochemistry and imaging then allowed Drubin and others to expand their studies to actin dynamics and endocytosis in yeast. In part 2, Drubin describes how his lab began studying actin dynamics and endocytosis in yeast using two-color, real-time fluorescence and kymographs. These tools enabled his team to confirm that actin regulated clathrin-mediated endocytosis. They discovered that BAR and F-BAR proteins stabilized the process by acting as a scaffold for actin and facilitating invagination and fission of the cell membrane to develop vesicles. Next, Drubin explains how he and his lab transferred their knowledge of endocytosis in yeast to determine how actin dynamics are harnessed to drive endocytic traffic in mammalian cells. In mammalian cells, his team observed the importance of actin-dynamin interactions in clathrin-dependent endocytosis. Interestingly, they found variability in endocytic site morphology and dynamics. Studies using stem cells suggested that this diversity in actin-mediated endocytosis is important for determining cell identity and development. In his final talk, Drubin explains how endocytosis can be used as a system to dissect the mechanisms of actin dynamics in yeast. He focuses on his lab’s research on three key processes: actin disassembly, filament capping and Arp2/3 nucleation. By giving an overview of the importance of actin dynamics in regulating a single cell process, endocytosis, Drubin highlights the crucial role of actin assembly and disassembly in both yeast and mammalian cells. Adams AEM, Botstein D, Drubin DG, 1991. Yeast fimbrin is required in vivo for actin organization and morphogenesis. Nature. 354: 404-408. Drubin D, Zhu Z, Mulholland J, Botstein D, 1990. Homology of a yeast actin-binding protein to signal transduction proteins and myosin-I. Nature 343: 288-290. Drubin D, Miller K, Botstein D, 1988. Yeast actin-binding proteins: evidence for a role in morphogenesis. J Cell Biol 107: 2551-2561. Kaksonen M, Toret CP, Drubin DG, 2005. A modular design for the clathrin- and actin-mediated endocytosis machinery. Cell 123: 305-320. Kaksonen M, Sun Y, Drubin DG, 2003. A pathway for association of receptors, adaptors and actin during endocytic internalization Cell 115(4): 475-87. Very nice talking that inspires me a lot. I am a students recently started in cell biology. Thanks Prof. Drubin and hope to gain more knowledge from your work.